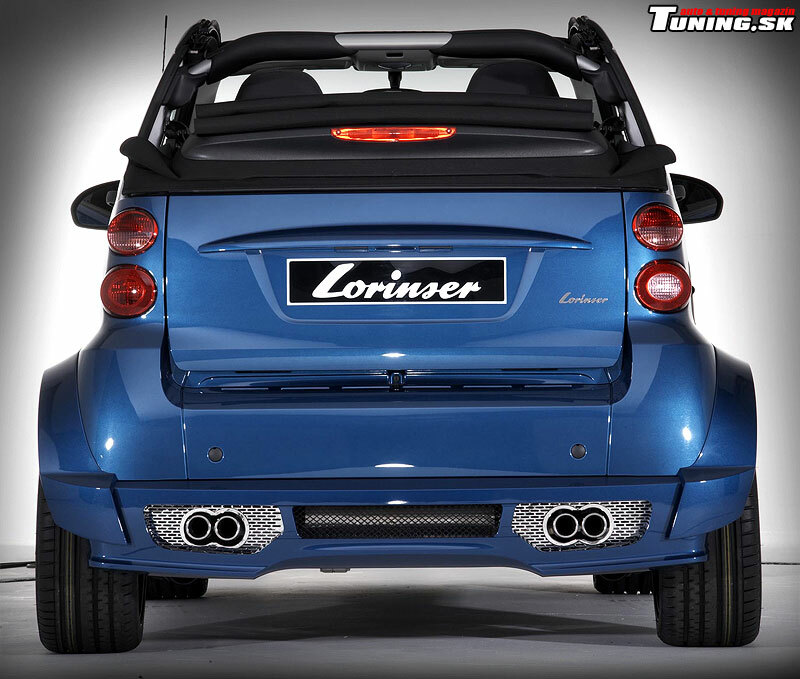 Lorinser Smart Fortwo – turbo midget! Tuning isn’t only about sharp Japan blades, European saloons or other „ordinary“ vehicles, but it’s also focused on different interesting cars. 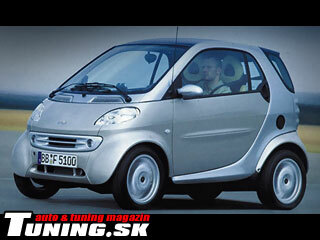 For example the Smart ForTwo. You can say that’s really compact and the best for a city. But nothing for the real tuning. And that’s not true. This brand is a part of Mercedes-Benz, so then also available for Benz‘s primary tuners. Lorinser, a German tuner, did some nice job on this midget and achieved something astonishing, that maybe looks unbelievable, but this article proves that nothing is possible. I think there’s no need to introduce this tiny car that is famous all over the world. It can be called the „city“ or „for women“, because its dimensions (2500x1515x1549mm) make him one of the smallest vehicles in its class and on this planet too. It weights only 805kg so the small engine inside can provide you some action ride. 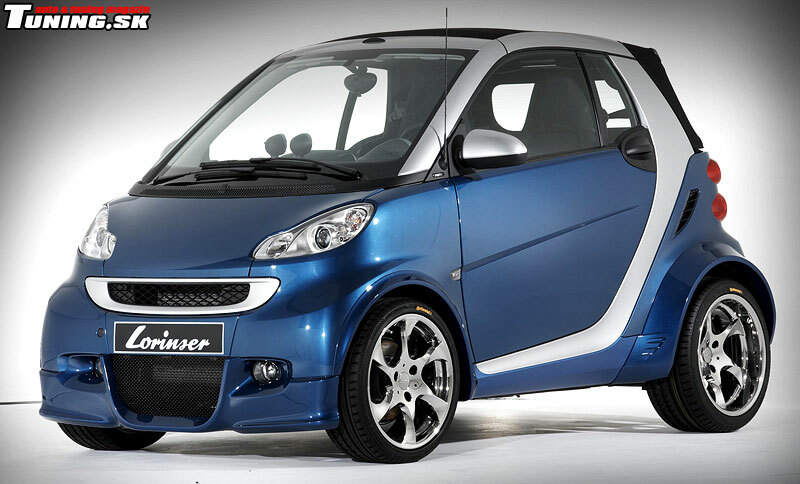 Generally, the Smart ForTwo is a small, but comfortable car that is 100% city approved. We can’t find any monster under the hood, but its low weight is more important to have fun. The basic engine is a 0.7 liter 3-xylinder OHC turbo engine producing 61hp (45kW). Simply the perfect car in these times of expensive fuel and restrictions. But there’s also more powerful engine of this „micro muscle“ made by German tuning giant Brabus. This version goes further with 75hp (55kW) at 5250rpm and 110Nm of torque. And these values are very interesting. The newest capture of Lorinser is also the smallest. 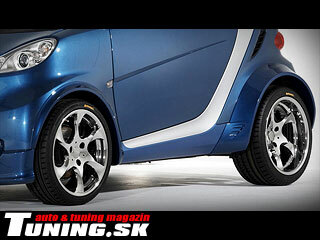 Improvements were made on the city sprinter Smart ForTwo. Owners of this midget can enjoy enhancements including higher performance and attractive design. 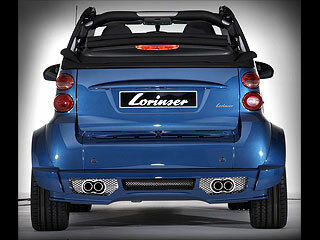 Great ammount of muscles is visible from outside and this guarantees respect for Lorinser Smart ForTwo. A new lowered front bumper with a massive central opening is characteristic for the front part and brings more air to the more powerful engine. Its shape is similat to the bumpers of other Mercedes modifications, so Lorinser means it seriously. There’s a nee pair of additional rounded lights and pair of lips. Lorinser also installed a sporting mask of the cooler. There’s no problem to make the car bigger, if you have so nice bodykit as Lorinser. You can see it at the first sight that the car is much wider. Exactly for 55mm. And that’s very unusual for the Smart. Amazed bystanders are guaranteed. Extended fenders are idyllic connected to unchanged sills that nicely match with the body designed by German designers. But the rear part is more interesting. You can notice that it’s more massive thanks to wide fenders connected to the new rear bumper. This tuning pack isn’t only about design, but Lorinser made some improvements on the engine of this 800kg beast&#61514;. These improvements boost the engine to 104hp (77kW) and this means that this shopping cart can accelerate to 100kmph in less than 10 seconds and reach 180kmph! And that’s too hot for this small car. Its monumental look is enhanced by 6-spoke 17“ aluminum rims (8.5 x 17" and 7 x 17" respectively) It wears Continental tires (245/35 R17 and 215/40 R17) and that’s quite bold move to install so big wheels on this tiny specimen. Also the interior involves some new improvements full of sporting materials as carbon fiber, aluminum and chrome in case of frames and moldings. There are sporting gauges (revcounter and speedometer) and also high-quality audio system with GPS and LCD monitor. 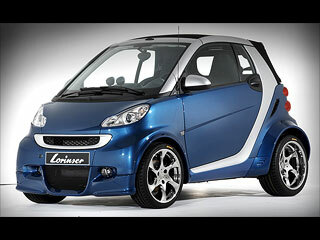 Your opinion on Lorinser Smart Fortwo ?